We want to turn to Denver. Teachers are on strike they are demanding for a more money they say they just can't survive on their teacher salary now these. 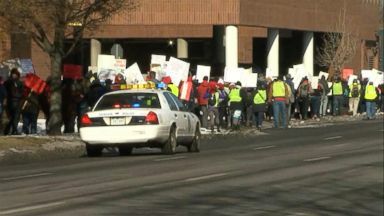 Our images from that strike taking place in Denver are very similar we've seen this now for the last couple of months other teachers' strikes. Across the country. What a check in wind Mike good Smith with K and GH in Denver Mike good teachers are on strike but schools. Are still open range. Schools are still open students are past their right now the majority of their teachers 86%. Already picketing site like this one. -- out here a lot of enthusiasm in the air I'm seeing teachers out here that I seen. Since the days of wine and many of unhappy smiles on their faces and I have a feeling. That's because of the progress that happened at the negotiation table yesterday that session lasted for about. Twelve hours in in the end both sides bad for the first time in a very long time. They finally see a path forward to ending the strike. So they had discussions yesterday they they do see that path forward but any inclination as to. Waits waive bills they'll go on mess we know that and teachers just went on strike there. At any idea this is going going to go on for days weeks. You know I think it's close to any. Me here pretty silly hardest thing money talks it seems like Denver Public Schools and ET drinking in our finally speaking this same language they've agreed on a base salary for teachers that would be 45800. Dollars a year they also agreed to start he tailed of the compensation schedule with teachers say it will be a lot easier for them to increase their salaries so big iron out a few details. They are very close to making a deal. Last spring day here and as mentioned earlier in the schools are Obey and so a lot of substitute teachers getting some time in their but. Any idea of what the in the classroom in these schools are like right now with all of these teachers on strike. We are hearing from Denver Public Schools they have plenty outside in the schools let go ahead and keep school open and how far they've acted double sometimes quadruple its. Class sizes so many of these students are learning in gymnasium and cafeteria as an other large spaces. Teachers hearsay that is no way to learn and the district agrees this is not sustainable long term so a lot riding on today's negotiation session they're hoping they won't have to be that much longer you. All right Michael Smith there in Denver for as they do so much for that update. 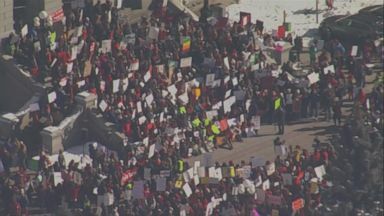 Thousands of public school teachers in Denver walked off their jobs on Monday for the first time in 25 years to demand higher wages. Classes have been cancelled for 5,000 students because of staff shortages after more than 2,000 of the city's teachers called in sick on Monday.